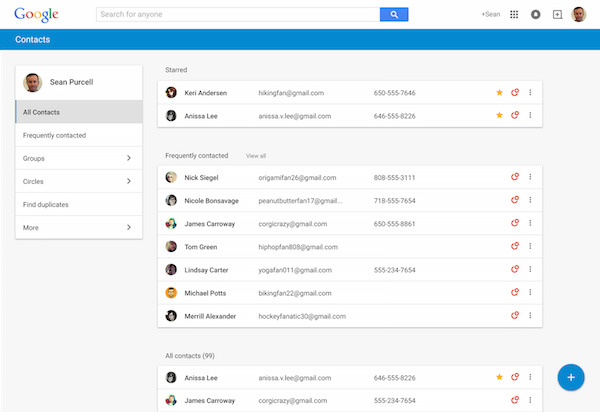 Google released a preview of the new Google Contacts interface. 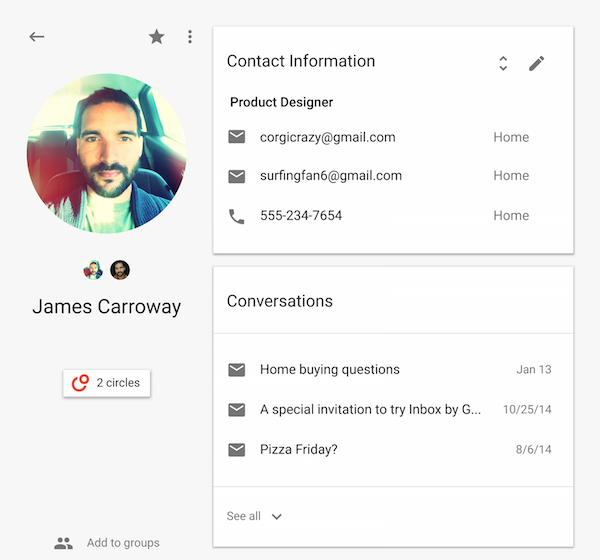 Powered by Material Design, the new Google Contacts improves some of the existing features: finding duplicates, Google Profile integration, while adding some new features: a list of recent messages, Hangouts sidebar, global search results from Google+. 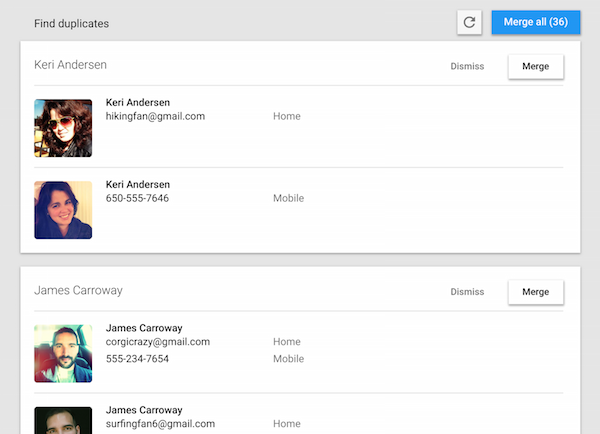 It also merges your contacts with your Google+ circles and no longer uses pagination. "The new Google Contacts comes with a fresh look and feel, and conveniently pools together all your contacts, circles, and the people you talk to most in Gmail," informs Google. Starred contacts and frequently contacted people are placed at the top of the page, followed by your entire address book, which now includes your Google+ circles. You can customize "your circles" and exclude one or more Google+ circles. Google Contacts now finds duplicates automatically and offers to merge all of them. You can dismiss some of the suggestions and better assess if they are actually duplicates. When you click a contact, Google now opens a card overlay with a bigger picture and more information from the Google Profile page. Google also shows the most recent email conversations and meetings with that person. The search feature now includes results from Google+. The first results are from your contact list ("personal results"), while the following results are from Google+ ("global results"). 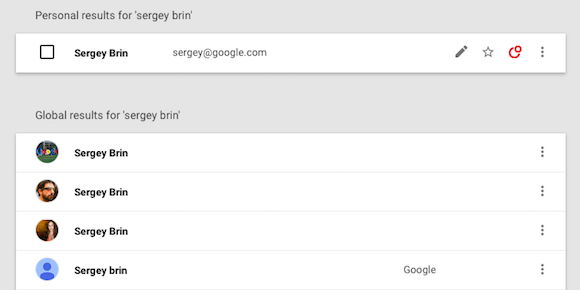 Some features aren't available yet in the new Google Contacts: importing/exporting contacts, restoring contacts, printing contacts, keyboard shortcuts. You can still find them in the old version of Google Contacts. 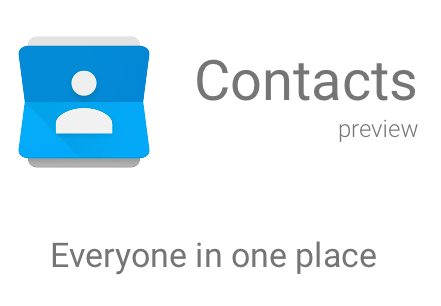 For now, the new Google Contacts is not available for Google Apps users. The new interface can be found at contacts.google.com/preview/all and it will be added to Gmail's contact manager over the next few weeks. You can also open Google Contacts and click "Try Contacts preview" in the left sidebar. How to go back to the old interface? Expand the "more" section and click "Leave the Contacts preview". it is going to to "page not found"